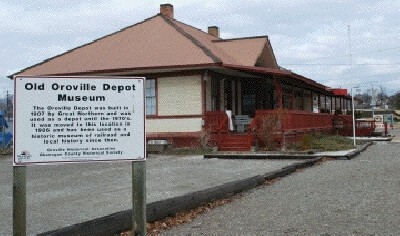 The Oroville Depot Museum includes both permanent historical displays and a large section that is changed every year. "The Salmon People: Stories Tell the Past"
The Okanagan Peoples lived in our area for thoushands of years. This year's exhibit gives a taste of life before European contact. In the HEART of the VIA 97 INTERNATIONAL Alliance/Corridor. The Northern Gateway to Okanogan Country. The Northern Gateway to the Okanogan Trails Scenic Byway. The Northern Gateway to the Greater Columbia Water Trail. In the HEART of the Pacific Northwest Trail.